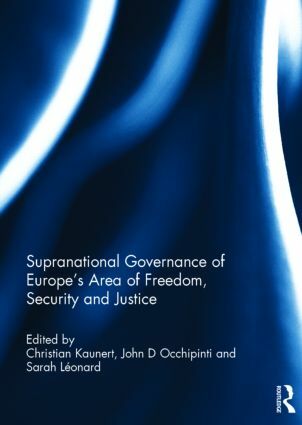 This book examines the evolution towards increased supranational governance in the EU’s Area of Freedom, Security and Justice (AFSJ). At the end of 2009, a successor programme to the Tampere and Hague Programmes was developed under the Swedish Presidency. Called the ‘Stockholm Programme’, it was adopted at a special EU Council Summit on 10-11 December 2009. The new agenda covers the period 2010-2014 and emphasises six areas of priority. In the context of these priorities, as well as the innovations introduced by the Lisbon Treaty, this edited book analyses policy change in the AFSJ, especially as it has been affected by the rise of supranational governance in this domain. From police cooperation and crime fighting to border management and counter-terrorism, much has changed, and the EU has taken yet another step forward in the direction of supranational governance. However, the various contributions also highlight that there are still problems and challenges remaining for the AFSJ. Collectively, this book considers how consequential the Lisbon Treaty has been for the AFSJ, as well as how successful the EU has been in achieving its stated goals as expressed in the Stockholm Programme. Thus, this book makes a significant contribution to the scholarly investigation of the AFSJ, but also to the study of European integration in general. 1. Introduction 2. Police, policy and politics in Brussels: scenarios for the shift from sovereignty to solidarity 3. EU cooperation on terrorism prevention and violent radicalization: frustrated ambitions or new forms of EU security governance? 4. Whither the withering democratic deficit? The impact of the Lisbon Treaty on the Area of Freedom, Security and Justice 5. Tacit procedural politics: institutional change and member states’ strategies in police and judicial cooperation in criminal matters 6. Tempering the EU? NGO advocacy in the Area of Freedom, Security, and Justice 7. The EU’s growing external role in the AFSJ domain: factors, framework and forms of action 8. Exporting EU integrated border management beyond EU borders: modernization and institutional transformation in exchange for more mobility? Christian Kaunert is Professor of International Politics, Jean Monnet Chair in EU Justice and Home Affairs Policy as well as Director of the European Institute for Security and Justice at the University of Dundee, Scotland, UK. He is Co-Director of the EUSA special interest section on the AFSJ. John Occhipinti is Professor in Politics, Director of European Studies, and Departmental Chair at Canisius College Buffalo, USA. He is Co-Director of the EUSA special interest section on the AFSJ. Sarah Leonard is Senior Lecturer in Politics, Jean Monnet Coordinator of the PhD Summer School in the EU’s Area of Freedom, Security and Justice, as well as Deputy Director of the European Institute for Security and Justice at the University of Dundee, Scotland, UK.